Lincoln’s Cathedral and Close have been shaped by many people and events. The stories surrounding milestones in the life of our building provide an instant and compelling link with the past, embodying themes which still resonate today. Our major project, Lincoln Cathedral Connected, aims to reanimate these stories, engaging people with the Cathedral’s history, archaeology and architecture through a programme of activities, events and interpretation which will inspire, educate and inform. This exciting and ambitious project will transform the visitor experience and engage a wider range of people with the Cathedral. Restoration of the Close’s historic character will create new areas where we can offer more dynamic, welcoming spaces. The project will make a substantial contribution to the economy of the region and set the Cathedral on a firmer financial footing, helping to meet the costs of conservation and making the Cathedral’s removal from the ‘Heritage at Risk’ register a realistic prospect. 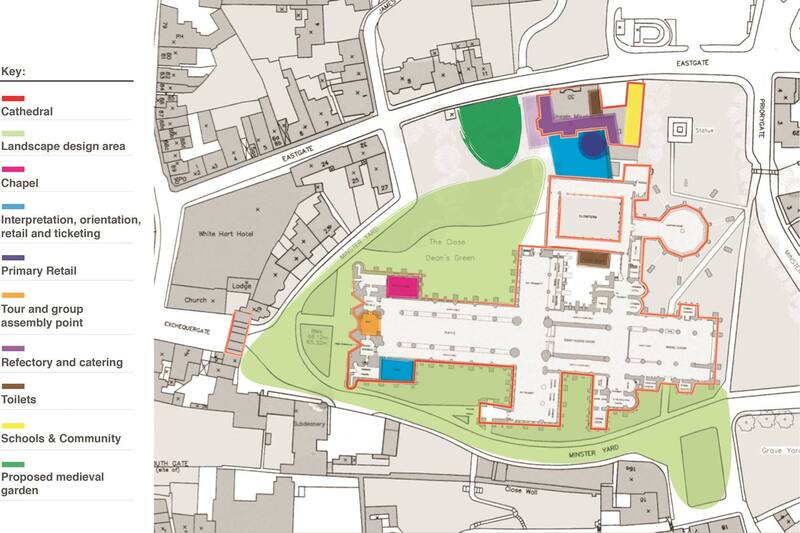 An overview of the Lincoln Cathedral plans. Click to enlarge. The project focuses on three interpretative themes, through which the history, archaeology and architecture of the Cathedral will be explained during your visit. We want to open a window into past lives from a variety of cultural and social backgrounds: the men of the Roman army’s Ninth Spanish Legion who built the first defensive fort at the site around 60AD; the 25,611 Bomber Command aircrew listed in Lincoln Cathedral’s Rolls of Honour; the memorial window dedicated to Rosamund Acworth, a local school-girl who died suddenly in 1899 during gym class; Close resident George Boole, the mathematician whose work was influential on the development of the digital technology; the macabre tomb of Bishop Flemming, an example of how art and architecture were influenced by the Black Death. Lincoln Cathedral was built in a world of people immersed in symbolism which today most of us can no longer ‘read’. Recognising emblems unlocks the medieval mind, and our ancestors’ concerns for upholding morality and leading a good life. We want to provide the opportunity to understand the morality tales played out in the Romanesque Frieze, be intrigued by the Gallery of Kings (some of whom may once have been queens! ), and be inspired to explore and decode the Cathedral’s many mysteries for themselves. Lincoln Cathedral demonstrates the incredible skill of the craftsmen and women who have built and maintained it over the centuries; a tradition continued today by our 30 strong works department. Our project will include conservation of some of the Cathedral’s most precious and internationally important architecture, which will provide a wonderful opportunity to engage with traditional craft skills as well as the building itself. A sketch of the revamped North Green, which will be opened out to the public. The Cathedral will not only act as a place of worship and history, but a wonderful place to spend time with friends and family. New facilities and relaxing open spaces will offer another dimension to our visitor experience whilst improving life in the historic heart of Lincoln. The projects will offer opportunities for both volunteering and employment. It will give a focus for greater co-operation between the cathedral and the city’s other tourist attractions to promote a high quality tourist ‘package’. We submit our application to the Heritage Lottery Fund on 29th Nov 2013 and will hear the outcome in April 2014, when we hope to be awarded a development grant to further develop our plans. This will include consultation with visitors, cathedral staff and volunteers and Lincoln residents. We would then submit a round 2 application in 2015, hoping to start work by 2016.